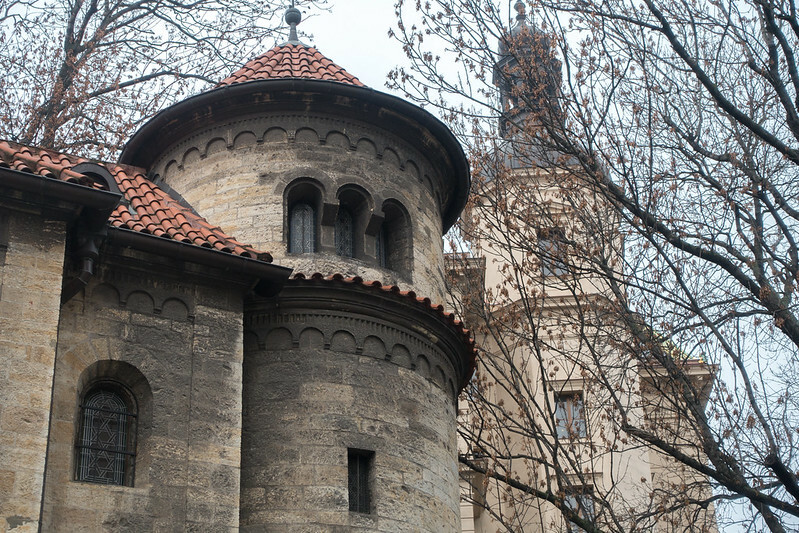 Post 3 of a series – you can read my other Prague posts here. Our final day in Prague (also my birthday) began with a solemn history lesson in the Jewish Quarter, and the weather corresponded with our coldest day yet. We spent the rest of the day cosying up in a monastery, a grand art deco restaurant, a charming book shop and finally an underground jazz bar, with a further helping of beer and sumptuous street food filling our bellies. We had another early start to catch the tour of the Jewish Quarter offered by City Sightseeing, which we found by looking for the red umbrella in Old Town Square. We were surprised when our tour guide opened his mouth and a broad cockney accent came out! 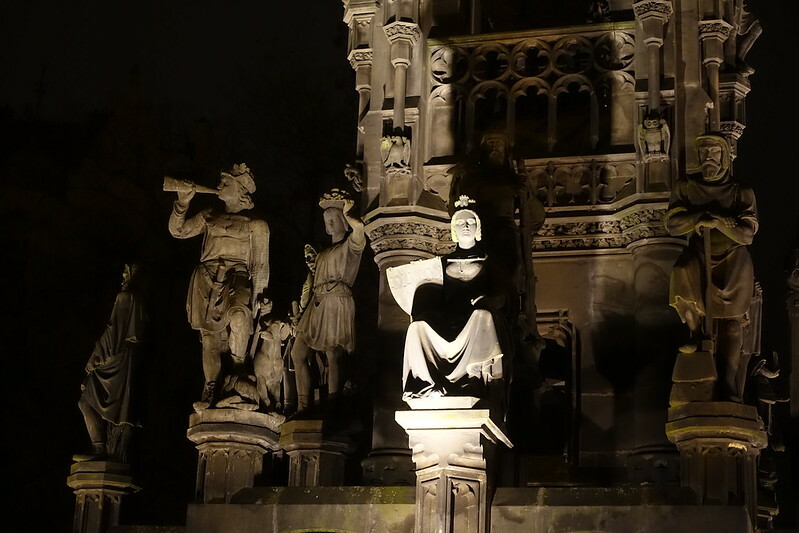 Though very different to our guide for the castle, he was similarly interesting, funny and personable, and this made the grim stories he had to tell of the Nazi’s occupation in the city just that bit easier to take in. He explained how the Jews were restricted to this frequently flooding section of the city and, heartbreakingly, how many of them were barbarically killed by civilians believing they were to blame for the plague. 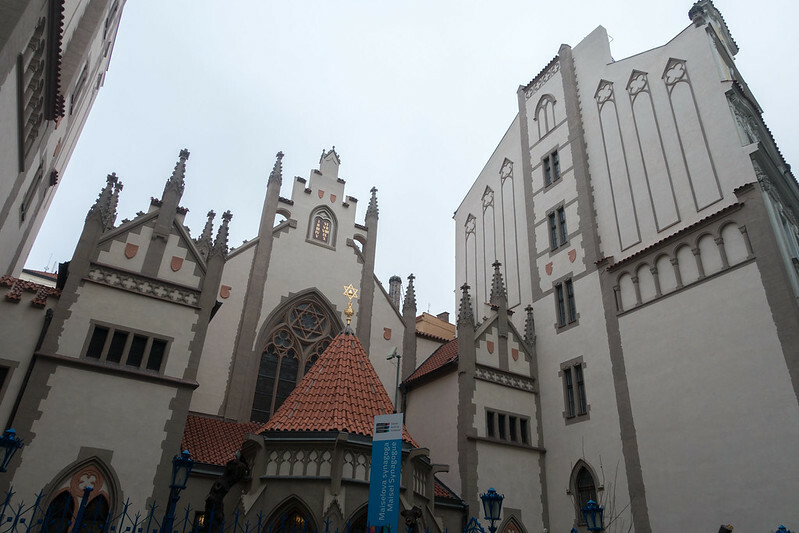 But this was interspersed with interesting facts, such as how years of religious warfare led to Prague becoming one of the world’s most atheist cities, whose many beautiful churches are now used as concert halls only. We were shown the mosques, including the single one the Nazis had intended to leave standing as a museum about an extinct people, and shown a chillingly overflowing graveyard of many layers deep. It was certainly a sombre tour, but also an appreciatively eye-opening one. 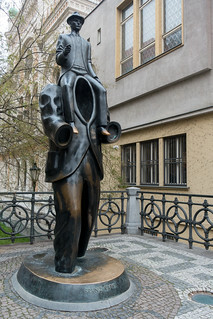 It finished on a more light-hearted note, at a statue celebrating surrealist Czech writer Franz Kafka. We next found our way to stop 3 on the City Sightseeing bus tour, intending to see the remaining parts of the tour. Originally we’d planned to return to Petrin Hill to see it in the daylight, but the dense fog filling the sky caused us to reconsider. 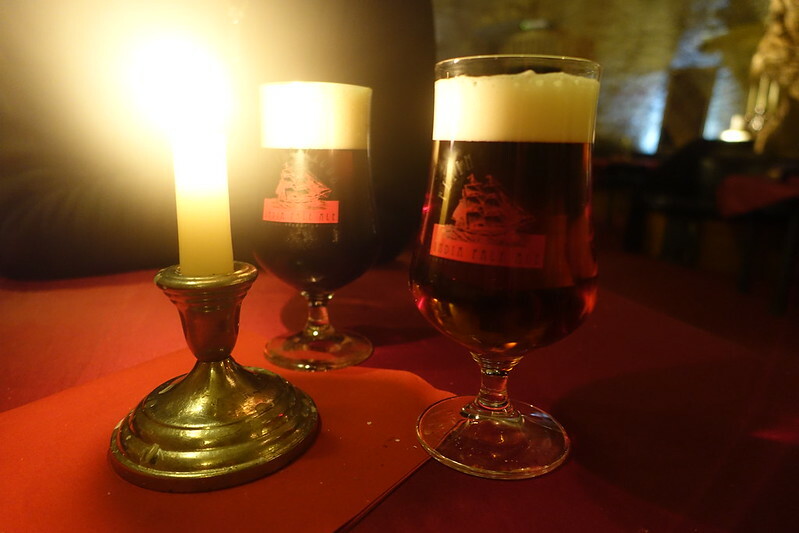 We decided instead to alight at the Klášterní pivovar Strahov, or the Strahov Monastic Brewery, which is basically a brewery, bar and restaurant housed in a monastery dating from 1628. Inside an unassuming door and down a dark set of stairs we found ourselves in a warmly lit cave, with candlelit tables and a bar. We made ourselves comfortable and tried the blueberry-flavoured and ‘Christmas’ beers. Afterwards we got back on the bus and listened to the remainder of the audio commentary, finally getting off at the stop 1. Helpfully, the venue I’d booked for lunch was nearby and we walked straight there. 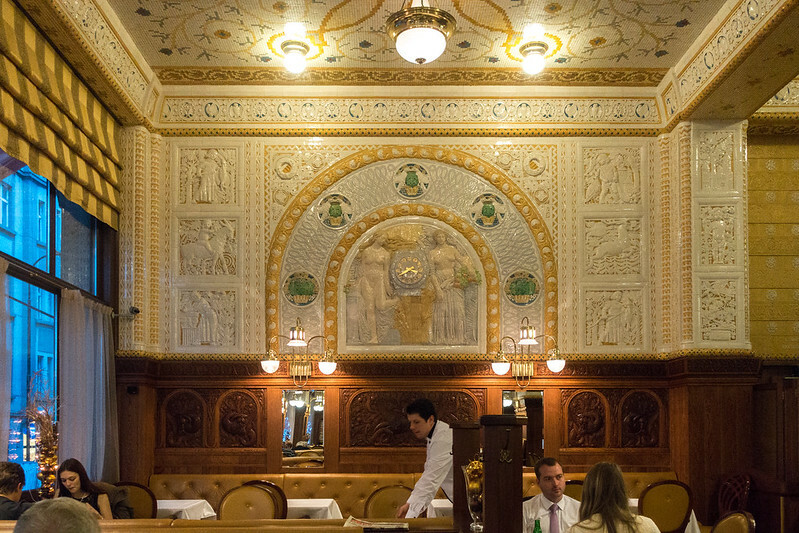 I’d been persuaded to book for lunch at Café Imperial by its grand art deco interior, and it didn’t disappoint: the polished, moulded walls, ornately carved wood and mosaic ceiling were stunning. 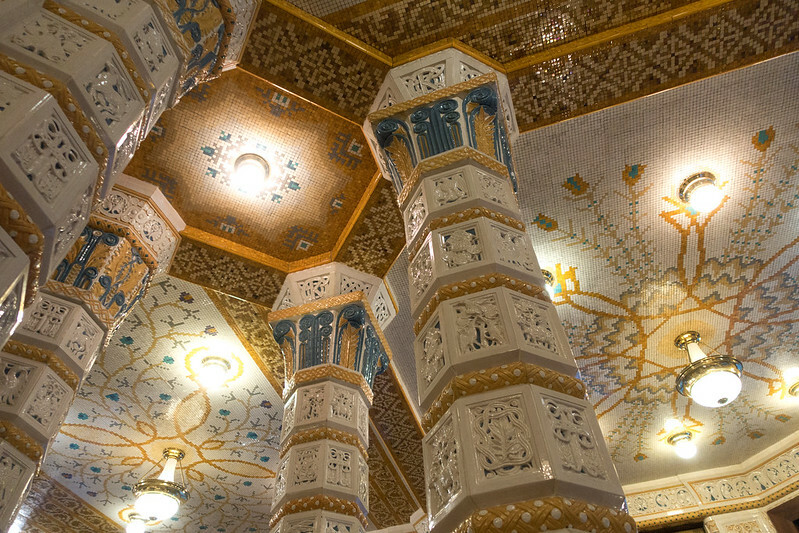 I only wish I could have explored the rest of the Imperial Hotel. I ordered the chicken broth to start, which came in an ornate white pot and contained an entire chicken drumstick, while Steve had a posh duck liver pate. I struggled deciding what to order for my main course and eventually picked the chicken roulade stuffed with salsiccia on barley risotto, thinking that I would have duck (offered here with red cabbage and potato dumplings) for dinner. Unfortunately this lunch filled us up too much to have a restaurant dinner, so I never got any duck and regretted not ordering it here! The chicken dish was tasty, but a little too salty and filling. Lesson of the day: always order what you want most, without regard for the future. 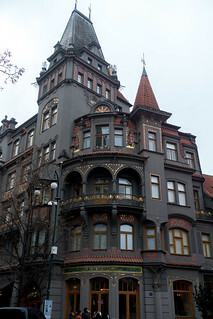 It was already dark by the time we left, and we decided to go and see the parts of the city we hadn’t yet seen on-foot. 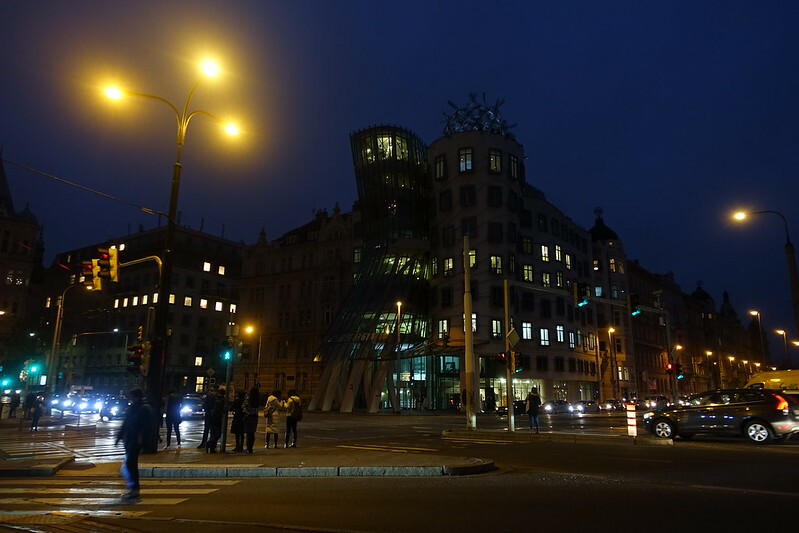 One of these was the so-called Dancing House, south of Old Town along the river. The building was cool, and the riverside held plenty of other architectural delights. 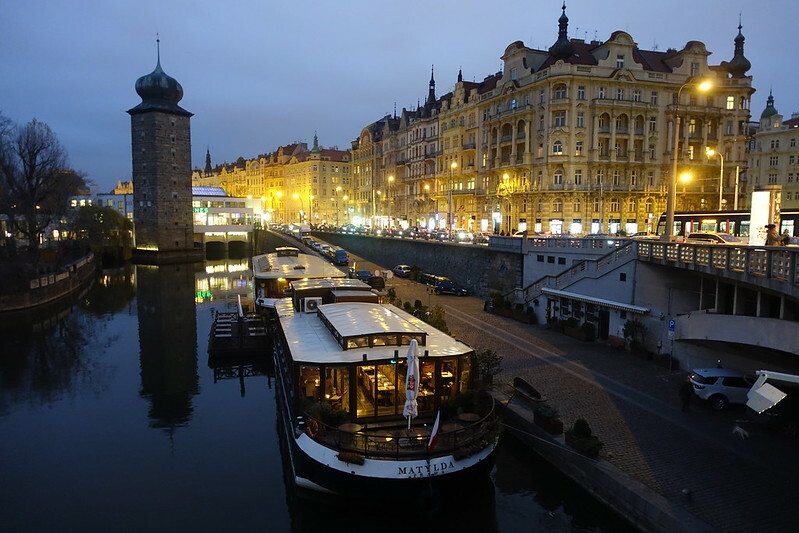 But the main attraction was definitely Vltava River, and the many glittering lights reflected in it. I spent the walk back to our hotel avidly looking out for bookshops. On the advice of our castle guide, I wanted to buy a copy of Milan Kundera’s The Unbearable Lightness of Being before we left. My desire was answered by Globe, an English-language bookshop with a café. Inside we found a warm and welcoming atmosphere, with a hip background music playlist to boot. I found the Czech authors section and sat myself down on the carpet to peruse the options. Eventually I chose my favourite copy of The Unbearable Lightness, and also bought a copy of The Metamorphosis by Franz Kafka. 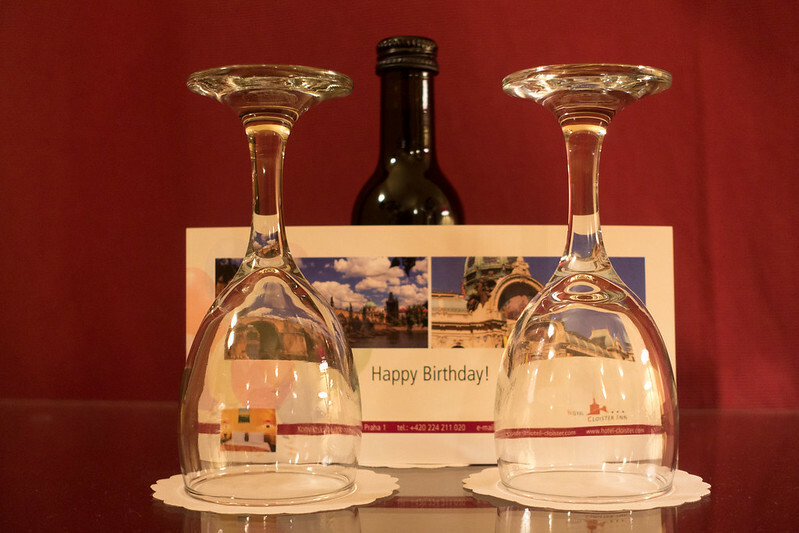 We returned to our hotel to decide what to do next, and in our room we found a card with ‘Happy Birthday’ on it with a miniature bottle of wine and two glasses! It was a lovely gesture… if only either of us liked red wine. Steve had the idea to go on a cruise along the river, and we particularly liked the look of a Jazz cruise, but unfortunately it was full. Our best option was to set off back into the cold air and see where the night took us. We wandered down to the dock to see if there were any other cruises left, without any luck. 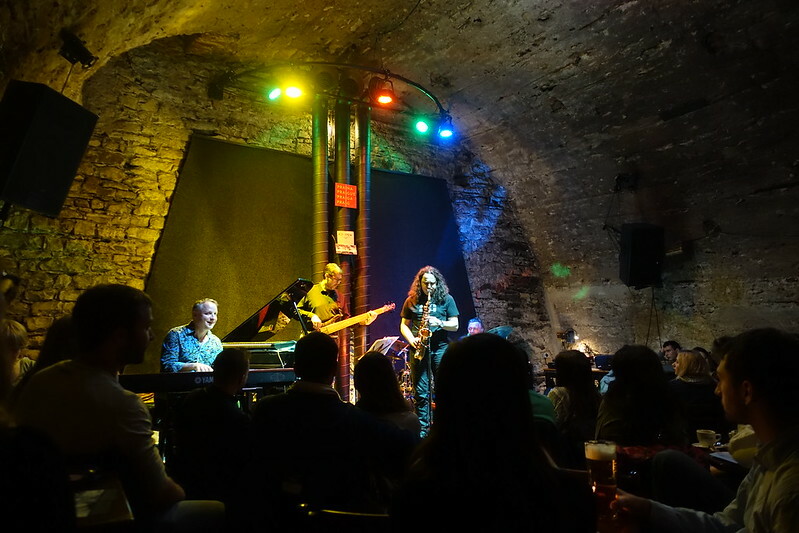 So we continued to wander through the now-familiar streets of Old Town until we came upon the answer to our night’s entertainment: an inconspicuous underground jazz club called AghaRTA. We’d never been to a jazz club before, and we couldn’t really say we were jazz fans. But this seemed like the perfect time to give it a try. The entrance was no more than a hole in the wall, leading to a narrow brick courtyard ending with a set of steps leading down. With the show not due to start for half an hour, we had just enough time to grab a bite to eat. Amidst Old Town Square’s Christmas Market we found a stall selling Hungarian Lángos: deep-fried flat breads rubbed with garlic and covered in tomato ketchup and finely grated cheese. At that moment, my fingers numb in the icy air, I’d never tasted anything better. We wolfed them down before descending the stairs to AghaRTA. Inside we found a small brick room with a bar and, after buying our tickets, were shown to a table at the back of an intimate, cave-like room with rough stone walls. A waitress squeezed her way through the maze of tightly packed tables and chairs to take our drinks order; Steve ordered a beer and I ordered a ‘Tutu’ off the extensive cocktail menu. We didn’t really know what to expect from the music, so we were delighted when Rhythm Desperados started playing. Their style of jazz had clear funk and Latin influences, which made it really accessible and catchy. 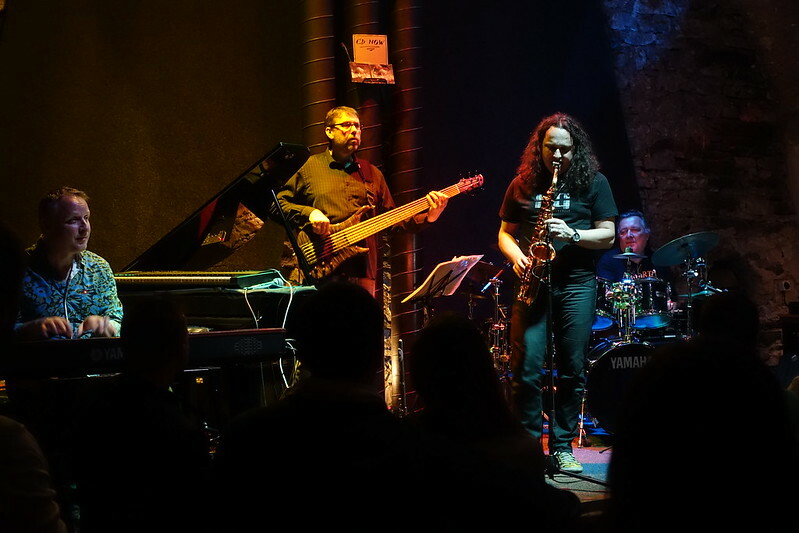 They were clearly really talented musicians too, and the saxophonist’s resemblance to comedian Ross Noble was an added bonus! Turns out, the ‘jazz bar atmosphere’ is genuinely as cool as it’s stereotyped to be. It made a perfect end to my 28th birthday and our wonderful three-day break in Prague. 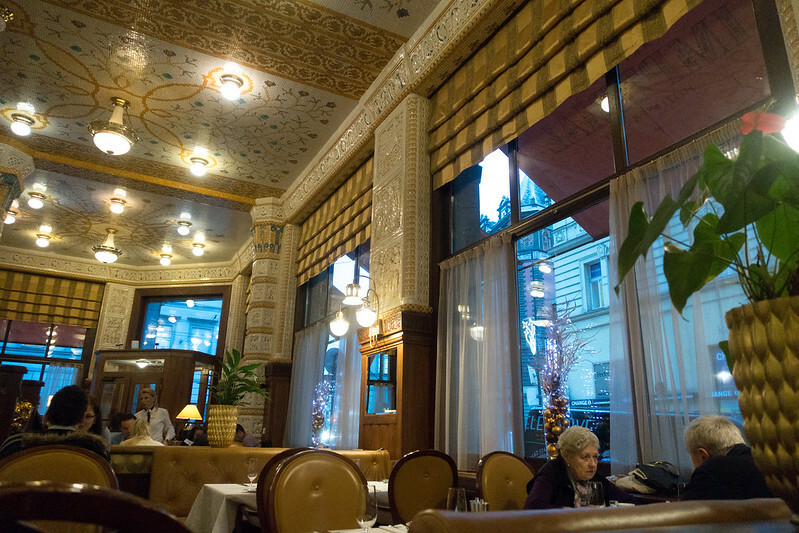 Posted in Central Europe, Czech Republic, European cities, Photography, TravelTagged Agharta, Cafe Imperial, Featured, Jewish Quarter, Lángos, PragueBookmark the permalink.